Okay, I mainly remember Oops a Daisy as a cute joke from the 1999 movie Notting Hill… you know, the scene where Hugh Grant’s character is trying to climb a gate into the secret garden and keeps slipping? He says oops a daisy every time he slips and Julia Robert’s character makes fun of him? Love that movie. But then a couple weeks ago I am on campus and someone near me drops something and they go to pick it up and say oops a daisy as it slips from their hands a second time. Then is showed up in a southern feed on Pinterest. So, apparently it is a southern thing. Who knew? 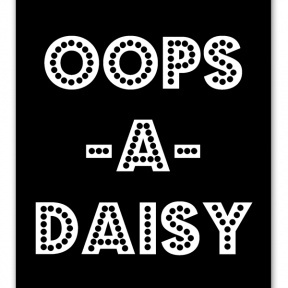 But oops a daisy is just a cute way of saying- oops! Or, oh no! And contrary to Notting Hill character belief, it is not just used by little girls or little old women.